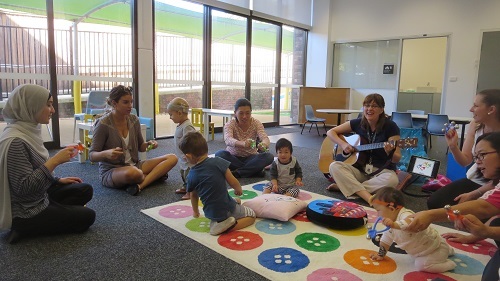 The Shepherd Centre recently wrapped up its music therapy program, MusicConnect, at our Newtown centre and is delighted families enjoyed it! MusicConnect encourages positive parent-child interaction through a range of music activities. Our Listening and Spoken Language Specialist, Tess, who co-lead the program with MusicConnect’s music therapy specialist, Roxanne, said it was fantastic. “Roxanne had an incredible variety of songs with accompanying props and instruments that the children and families really engaged with and enjoyed,” Tess said. 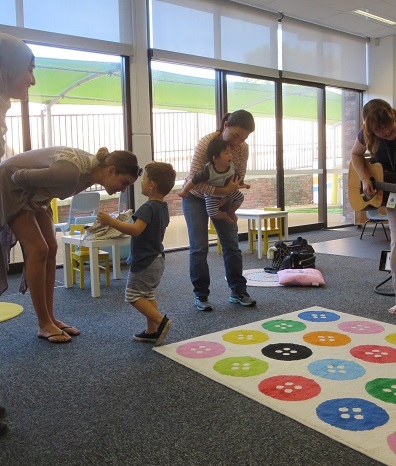 Over eight weeks mums, dads and tots were led through a range of music activities, including singing and dancing to popular kid’s songs and nursery rhymes, as well as playing a variety of musical instruments, such as toy drums, tambourines and rattles. Tess said the drums were a clear favourite with the children. The activities enabled parents to connect with their children through meaningful play and helped further children’s learning and development. “It was wonderful to be a part of MusicConnect and I would definitely put my hand up to do it again and encourage all families to participate in this lovely program,” Tess said. To find out more about MusicConnect please visit the website at www.musicconnect.net.au. To find out more about The Shepherd Centre’s programs, please click here.